The red white and blue State Flag of Texas depicts the stunning white lone star on the vertical blue background together with horizontal stripes of white and red. 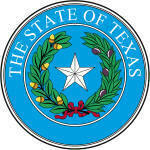 The Texas state flag serves as a symbol of honor, heritage and regional pride and is displayed at state buildings. The Texas State Flag is also flown on national and state holidays and on any other days proclaimed by the governor. There is an Order of Precedence for flags. State Flags are displayed in order they entered the Union. Car Flags are often displayed to represent of an individual's allegiance to their state. Texas State car flags are used by their owners as mobile emblems of their home. Car flags are usually made from strong materials and are attached to a car via a pole and clip window attachment. but are fighting under no recognized flag." According to the ancient laws of heraldry a star symbolizes honor, achievement and hope and an emblem of leadership and excellence. Each point of the star on the flag has been given an unofficial meaning. The author and historian Adina Emilia De Zavala (1861-1955), a preservationist of Texas history who served on the executive council of the Texas State Historical Association, described how each point stands for the characteristics of an outstanding citizen which are: fortitude, loyalty, righteousness, prudence, and broadmindedness. Who designed the Texas State Flag? What is the history of the Texas State Flag? The names of the flags flown during this period included the Lone Star and Stripes/Ensign of the First Texas Navy, the Come and Take It Flag, the Alamo Flag, the Dodson Tricolor and the Burnet Flag. The 'Come and Take It' flag was raised at the Battle of Gonzales, the first military engagement of the Texan Revolution, in October 1835 when the Mexican authorities tried to regain a cannon that was in the hands of the settlers. The Texas Lone Star and Stripes, used by the Texas Navy, was a variation of the US Flag with the addition of a lone, white star. The Alamo Flag was not actually flown at the Battle of the Alamo but became become a symbol of the Texan's fight for freedom and independence. The design was created by replacing the Eagle in the center of the Mexican tricolor with the date "1824". This date was a reference to the 1824 Constitution of Mexico which Texas was fighting for. 1838: The final Texan flag was introduced to the Congress of the Republic of Texas on December 28, 1838, by Senator William H. Wharton and was adopted on January 25, 1839 as the final national flag of the Republic of Texas. Texas, one state under God, one and indivisible." 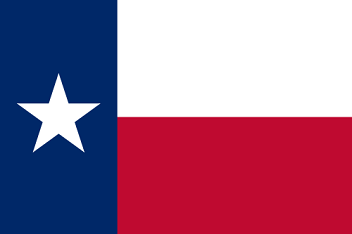 The Texas flag is kept and used as required by the code specified in the constitution of the state. Official State Nickname "Lone Star "